In 2018, we have continued our renovations and improvements. Our commom area flooring has all been replaced. 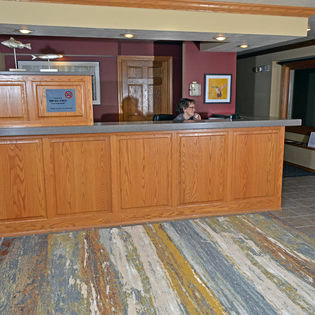 This means beautiful porcelin tile in our lobby and entry. New hallway carpet throughout the building inclusing the stairs the confernce rooms, the fitness toom and even the employee breakroom. All of the common area walls have been repainted to match our new color scheme. And finally we've added new art work to our hallways and common spaces. From abstract canvases to waves, water and of course bircfh trees - the artwoork mirrors the feeling you will have while staying in any of the suites at Westwood Shores. In 2017, a major renovation project of nearly $500,000 was been completed at Westwood Shores Waterfront Resort in Sturgeon Bay. The project included a complete makeover of all of its 38 suites. The work encompassed new paint, carpeting, furniture, bedding, accessories and artwork. This ambitious refurbishment project is the culmination of a year of planning by the resort’s management, board and interior design firm partner. “We are thrilled to unveil the results of the renovation, which provides a sophisticated and modern look for our property. But more important is the reaction of our guests, and they have been overwhelmingly positive. People are raving about the updated suites!” said Denise Stillman, principal at Foremost Management Services Inc., Westwood Shores management firm. 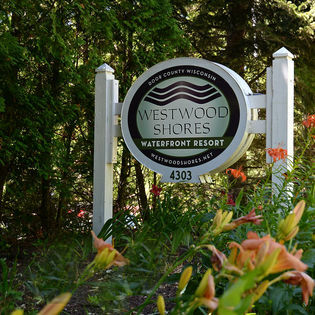 “This project not only signals exciting changes for Westwood Shores, but also presents a unique environment among Door County resorts,” added Kathy Beth, Director of Operations. “The colors, textures, art and materials in the new suites echo the water, woods and rocky beach of Westwood Shores’ natural surroundings, creating a seamless experience for our guests,” explained interior designer Katie Harding. The resort is situated on the bay of Green Bay shoreline, so the design concept focused on bringing the outdoor beauty inside." 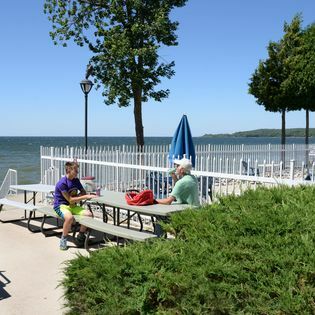 Westwood Shores Waterfront Resort is located at 4303 Bay Shore Drive, Sturgeon Bay Wisconsin. The property boasts a panoramic view of the bay of Green Bay waters from each of its 38 luxury suites featuring fully equipped kitchens, gas log fireplaces and whirlpool tubs. Resort amenities include indoor and outdoor pools, fitness center, hot tub, sauna and outdoor grills.